SEATTLE, Sept. 4, 2014 – Boeing (NYSE:BA) and United Airlines are celebrating the delivery of the airline's first 787-9 Dreamliner. United will become the first airline in North America to operate both the 787-8 and 787-9 variants of the Dreamliner family when the airline launches 787-9 service later this month. The airplane is seen here during one of its test flights. SEATTLE, Sept. 4, 2014 /PRNewswire/ -- Boeing (NYSE:BA) and United Airlines are celebrating the delivery of the airline's first 787-9 Dreamliner. United will become the first airline in North America to operate both the 787-8 and 787-9 variants of the Dreamliner family when the airline launches 787-9 service later this month. 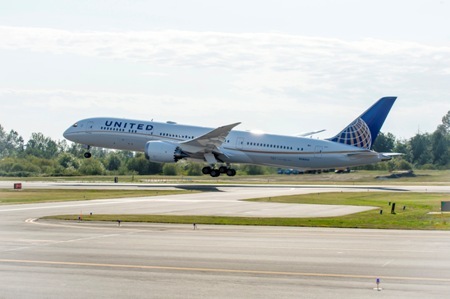 "We're proud that United has become the North America launch customer for both the 787-8 and 787-9, marking another important milestone in the successful history of Boeing and United working together," said Brad McMullen, vice president of North America Sales, Boeing Commercial Airplanes. Earlier this year, United announced it will fly the airplane on what will become the longest 787 route -- nonstop service between Los Angeles and Melbourne, Australia. The 787-9 complements and extends the 787 family. With the fuselage stretched by 20 feet (6 meters) over the 787-8, the 787-9 will fly up to 40 more passengers an additional 450 nautical miles (830 kilometers) with the same exceptional environmental performance – 20 percent less fuel use and 20 percent fewer emissions than similarly sized airplanes. The airplane leverages the visionary design of the 787-8, offering passenger-pleasing features such as large windows, large stow bins, modern LED lighting, higher humidity, a lower cabin altitude, cleaner air and a smoother ride. United operates 11 787 Dreamliners with an additional 54 on order, including the 787-10.